Each time I take a group out for an experience with the herd I am always curious as to who will show themselves, what horse, what conversation, what theme will be present for the group. Our first day out with the herd we walked out to see what was there for us. Happy came walking towards the group, with a medicine of wounded healer. Each woman that came to the retreat this weekend came to look at another way to be with their pain, their wounds, as we all have them and how differently we want to hold them. Synergy in the connections with the women were apparent, strong and unyielding. Bonds created right away as there was resonance with the wounds that were here. I watched, held space, facilitated and also took in for myself the message and medicine of the wounded healer. Happy is a horse in our herd that was rescued from the SPCA. The only horse in our herd that doesn’t directly belong to us, he is a big piece of our program and holds tremendous medicine with our herd. He holds the medicine of wounded healer – the power of our capacity and our ability to transmute our wounds into wisdom, teaching and strength. He has been through trauma, has been seized from a severe state of neglect, experienced heartbreak watching horses he bonded with at the SPCA go to new homes. He came to our herd, guarded, uncertain, stressed easily, and he moved through it, being in a space that held him in his healing. I asked the women as Happy came up to us, what they saw in him. Could they see his wounds? They all said no, as he nuzzled with us, stood away from his herd in his strength. He was giving us a mirror and a model of strength, of awareness of what it is to be a wounded healer that moves from a place of wounding to a center of wisdom. I believe and hold true that one of the most courageous things we can do is to let go of our pain and let it be something beautiful, strengthen and to seek out the wisdom of what it holds for us. I shared in my own journey, the pain I have gone through, the wounds I have moved through and was reminded of them this weekend. Our journey of growth isn’t easy, it takes courage and bravery, compassion and forgiveness, to let go and witness our own defaults that no longer serve, take responsibility of our piece in it and find a place to truly let go and go to the grace of finding the gift in what we have been through. It’s intense at times. It requires patience and self love and at the end of it we rise, stronger more solid than before. I think we believe ourselves as fragile and weak, not to take away from any pain we have experienced but our perception of ourselves is not always the one that is the most empowering. I don’t know why we fail at times to witness another perspective of ourselves. 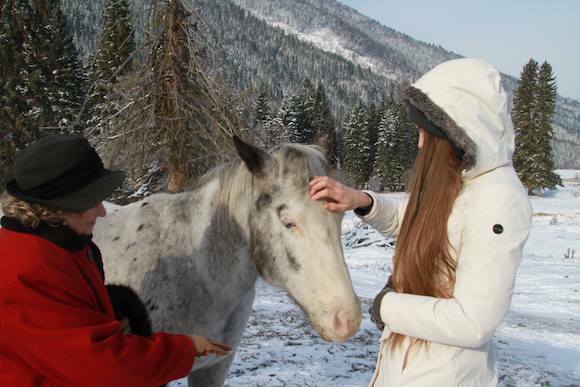 I believe the medicine of horses is that we find it there, reminded of the strength and resiliency of our soul. Take a moment to consider that the pathway forward is one of being with your wounds and bringing them to light so you can illuminate them and transmute them to something else. Be reminded of your strength and be nudged to the place of courage to let go, forgive, move on, get what you need from this space and move to what is now calling you. It is ok for us to hold our pain at times, and it is ok for us to let it go, maintain the boundaries and sacred space you need for yourself, but let yourself seek out and know the part of you that witnesses you and your journey in a different way. If you could hear that other voice what would it say?